Aside from the stint up Marcy, today was my first real forray into the Great Range. I got my money’s worth via our decision to hike Gothics from the steep side that has cables in place over the bare rock faces, making it a four limb ordeal. 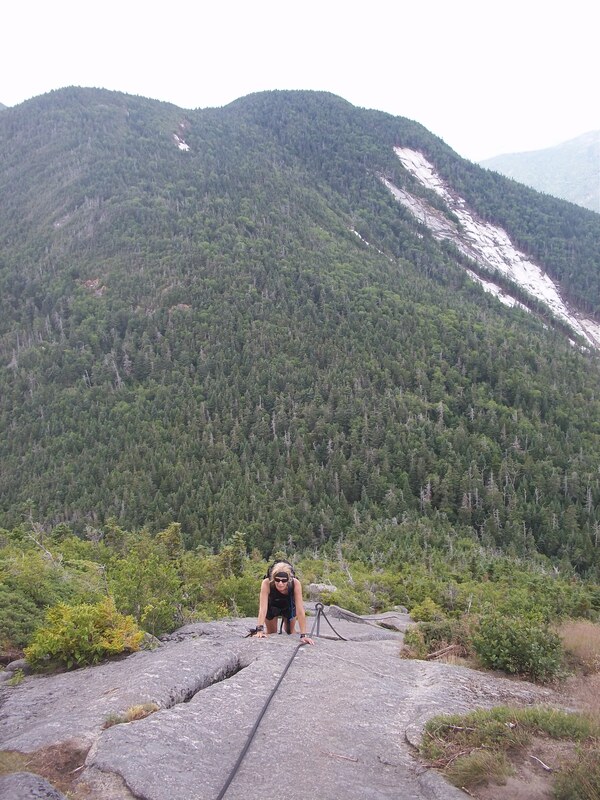 I would rank this as my most challenging climb to date in the high peaks, and I continue to grow ever-nervous about the impending climb of Saddleback and Basin, which I may push off until next year. To be clear, I had a great day! The views were amazing as always, and the challenges, though tough, were not insurmountable. 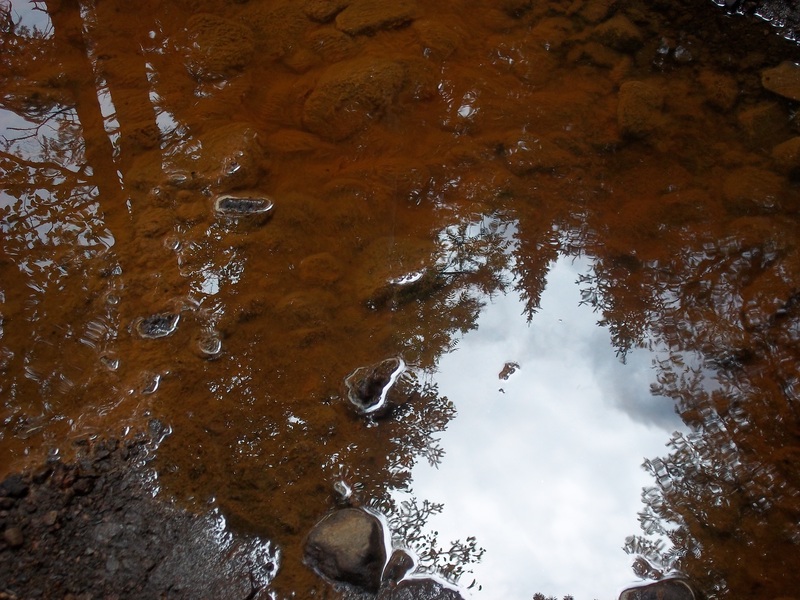 We dropped a car at St. Huberts near the Ausable Club and drove a second car to Garden to begin the trip, picking up the Ore Bed Brook Trail. The first really cool thing we encountered was the giant slide on Saddleback that we had to climb on route to Gothics. We walked up part of the slide until we came to a ladder with about a million steps, bringing us over the steepest part. 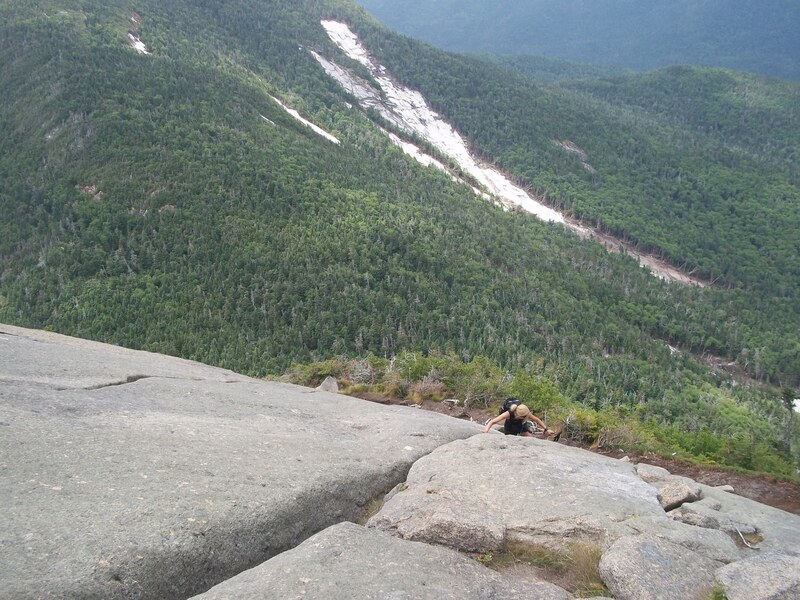 Other than the very tiny stretch on Big Slide (which is not named for having big slides but for the appearance of the summit), this was my first rock slide climb and it was pretty fun. 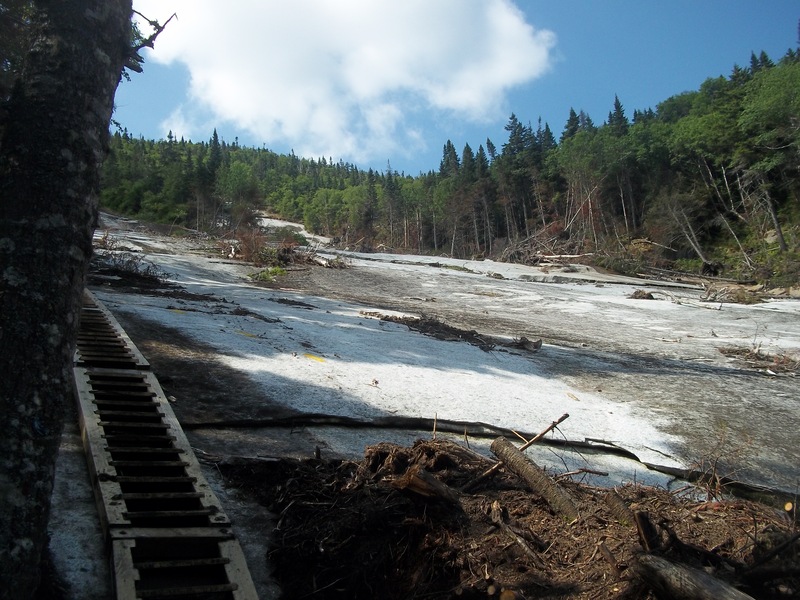 After the slide, the terrain started becoming much steeper as it wound back into the trees. Eventually, after we’d been above treeline for a bit and climbing some rock faces and scrambles, the pitch became even more dramatic and the cables affixed to the rock came into view. I’ve been wanting to climb Gothics from this direction for awhile to see the cables and the views I’ve heard about, and because most who have climbed it this way have raved about the experience. Back in 2004(?) the cables had actually been removed from the mountain according to the guide book – it amazes me that people could actually ascend from this side without them. 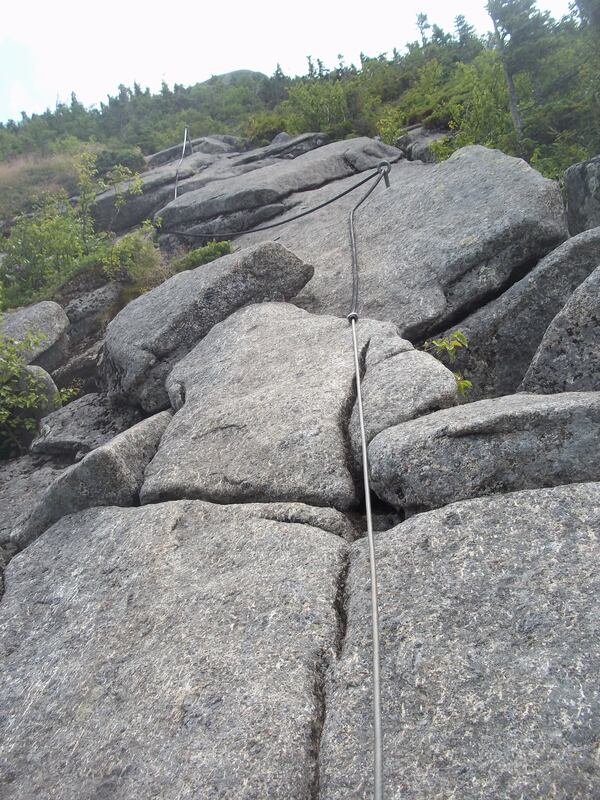 The cables were in place for most of this vertical rock ascent, which made it fairly easy to hike up while holding on. The scary moments came during the two different points where the cables disappeared for a bit. At one point I’ll admit to having a slight panic attack, when I realized I had to get myself over a couple of large boulders on a steep pitch with no handholds or footholds that I could find. I looked behind/below me and it truly seemed like if I fell, there was a good chance I could slide right off the mountain. I also knew I would encounter these situations again and had to get over my fear if I was going to complete the 46… so I leaped with all the confidence and effort I could muster, and I made it without stumbling. Huge sigh of relief! Now with all the research I’d done before this hike, reading about the approaches and descriptions of the routes, and talking to other hikers who had done it before… it baffles me that not one person mentioned the false summit – that when I finally got to the top of all these cables and vertical rocks, I would not be on the summit but on a shoulder of Gothics. I actually got angry when I reached what I was certain was the peak and was told by others up there that the summit was “over there” (pointing far to the left, at a peak that looked a million years away). It wasn’t a million years away and we got there pretty quickly and without much difficulty, but it was a bit of a letdown initially! Also, I’d read someplace that there were caves near the Gothics summit and had planned to find and explore them. 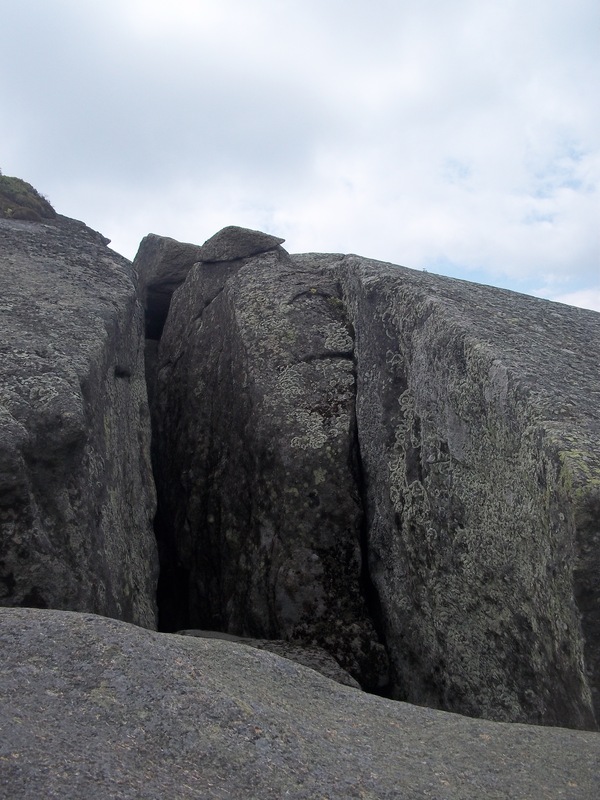 I think I saw the entrance to the caves on those open rock faces on the shoulder, when I was pulling myself up with the cable, but at that point I was just dying to get to the top, and decided to forego them. After Gothics, Armstrong seemed pretty simple and uneventful. 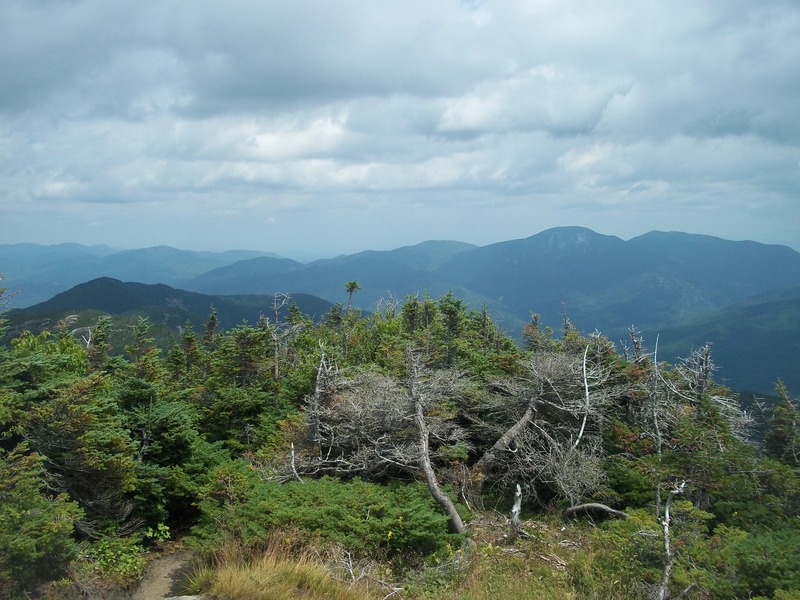 I actually mistook the summit for an overlook and continued on the path until I realized I had been descending far too long – ended up having to climb back up. The path to Armstrong from Gothics is pretty easy, with some steep sections but nothing too difficult. We descended Armstrong via the Beaver Meadow Falls trail, which was absolutely gorgeous but not easy. There were lots of steep pitches and a host of different terrains, from loose dirt to crumbly rocks to big boulders and scrambles. I’m glad we took it though, because as slow-going as it was, it was a really pretty route with a lot of points near the Armstrong peak that gave incredible views. Near the bottom were the falls, which were also a nice visual treat. We took the Lake Road back to the car at St. Huberts, wrapping up the day. 17 down, 29 to go! I think that these were my favorite pictures to look at so far. Thanks, Lisa! I was, as always, wishing the camera did a better job of capturing depth perception. I tried to post a few others but wordpress is NOT easy to use – it’s very buggy and doesn’t let me do what I want to do most of the time. It kept not recognizing some of the photos I uploaded so I finally gave up. What a great hike! I look forward to this one…and many others…but we share this fear of heights (and falling)…knowing the panic started but you were able to overcome lets me know I’m not alone…and I can do it too! Almost wanna yell “bring it on” thinking about it! LOL So glad you had a great hike!! I’m trying to knock off the mountains strategically, to slowly build my experience, fitness and confidence levels. Started with many of the easier/shorter ones, gradually building up to tougher and longer. And of course it’s not a foolproof methodology, but if you will yourself to succeed, chances are much greater that you will, whereas if you think you’re going to fall, you’ll be more likely to… that’s what I try to tell myself in these moments, anyway! Hope we can hike together soon, Angie. What’s next on your agenda? I hear Colden is back on for the 4th – did you get an email? Wow! That hike looks and sounds like a blast! Just curious, how long did the hike take? I didn’t see it anywhere in the write-up. It was a slow one… I would say we did about 14 miles in 11ish hours. It was lots of fun! Something to put on your list for when you’re all healed up. Those cables look like hard work but fun!! More memories of one of the most spectacular hikes that I’ve ever hiked. I’m glad that we did it together! I can’t wait for our next adventure Pru!!! 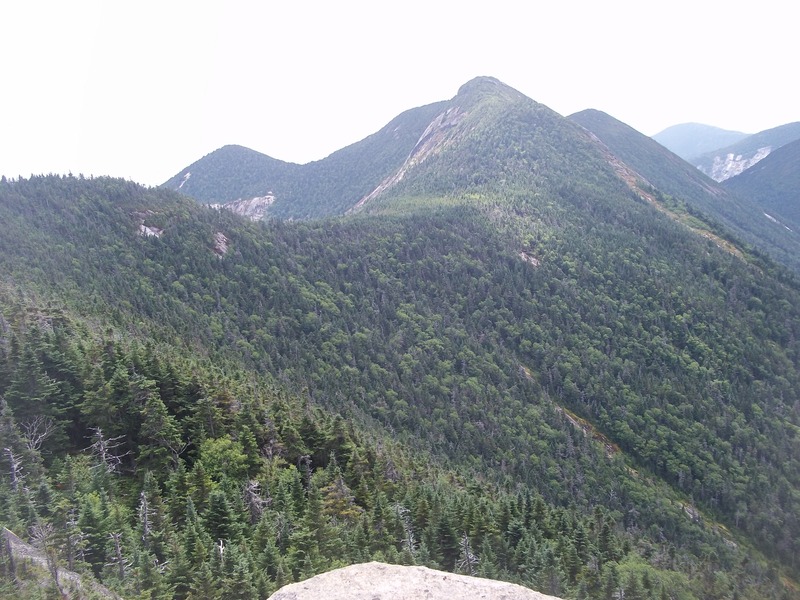 The thought of staying at JBL (something I have always wanted to do), cutting 3.5 miles off the initial hike to Basin/Saddleback, tackling all that technical stuff on the two mountains, and then descending down the slide/ladders on the Orebed Brook trail…how much longer????? I am both excited and terrified. Can’t wait!! It is a tough and grueling climb, for sure. 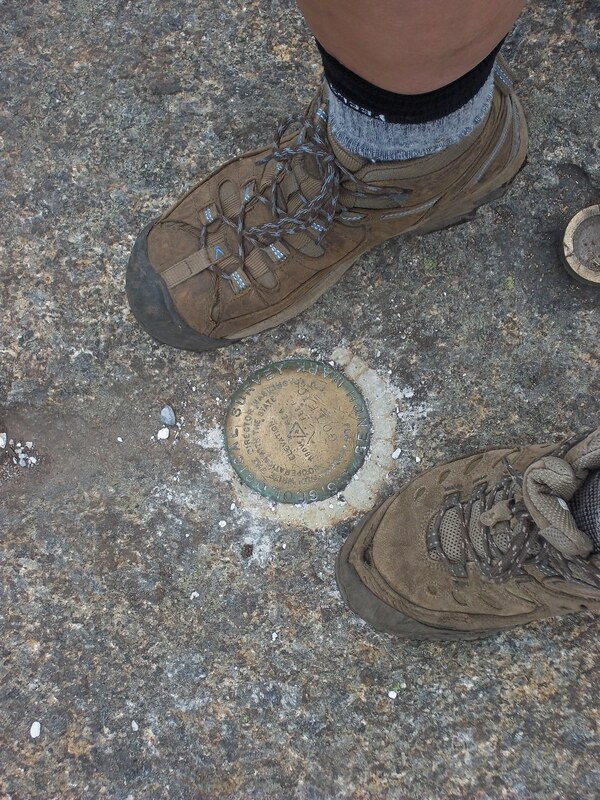 I did the same hike and added the Upper and Lower Wolf jaws. I’ve got 10 peaks to go for my 46R. Luckily, they are the smallest ones left (except for Esther and Whiteface – saving them for last). Congratulations on a great climb! Very nice Photos, too! Thanks so much for your kind comment, and best of luck in the tail end of your 46er journey!